Herself Farm is a privately owned small horse farm, located in Lewistown, Maryland. It is the home of our lovely Warmbloods, Thoroughbreds and one Arabian! Read my Bio! I purchased my first warmblood Sparkle Herself from Monocacy Run Farm in 2004, G. Beda'czzled Herself. is the first Warmblood of my own breeding, born 6/5/2006. Our third warmblood foal is Ironrose. Born 3/21/2011, by Ironman out of Mal's Mystery. Our second Ironman foal is IronReign, Born 5/4/2012. By Ironman out of Jr's Freedom. Herself Farm became our home in 1988. We are the third owners of the farm, originally named "Black Acre" which was built in 1969 by the Wiliford family. The Wiliford's had two equines "Wing" and "Caprice." Their beautifully hand carved wooden stall plaques still hang in my kitchen, where the original owners place them. This lovely farm has a magnificent view of the Catoctin Mountains and is surrounded by farmland. The quiet, peaceful charm is the culmination of my childhood dreams of owning a small farm with my horse in the backyard. 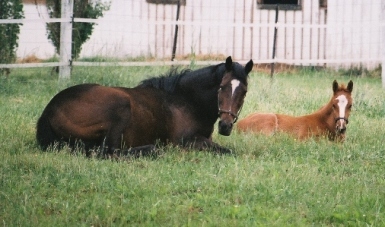 Tavaka, my Thoroughbred and Perky, my Arabian moved here with me from Long Island, NY. Both left me in 2005, Tavaka, my friend of 28 years died in January of 2005, at age 31. Perky, my best buddy for 17 years, and Tavaka's best friend, died in September of 2005 at age 18 Please see in Memory. 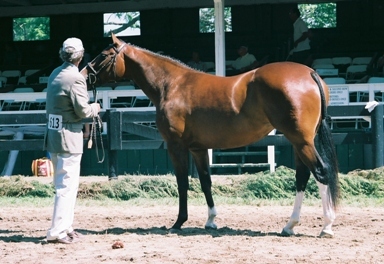 Greatthingstocome, who arrived in 1994, and took me back to the show ring, sadly passed away Nov. 11, 2011 at age 21. Air Mal, who has been with me since 1998, is now my oldest horse, at 19 years of age. For 20 years I also raised and exhibited beautiful Silver Persians. Horses were always my first love and still are. Please read my bio to see my equestrian past. Daz now has a cousin! Check out the NEWS!